During the rainy month of February, we almost completely close the camp on Mumbo (apart from a few intrepid self-catering guests) and spend the time refurbishing and making improvements. 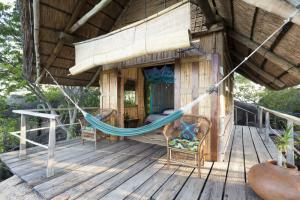 Jurie and the carpentry team removed the tents from platforms 1 and 5 and built beautiful, big reed, wood and thatch bungalows on the existing decks. Our team have perfected a very local, environmentally sensitive building system, using all local and sustainable resources: thatching grass, reeds and timber, to create these lovely dwellings. We now have three reed bungalows and two tents on the small islet (and the family tents just off the beach on the main island). The new bungalows are slightly more spacious than the tents and feature the same furnishings with the addition of enormous mosquito nets over the beds. They look too gorgeous as you can tell from the picture!